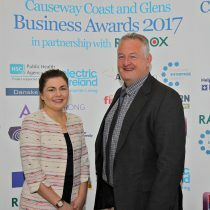 Managing Director of ATG Group Dr Mark McKinney and Environmental Quality Assurance Manager Claire McCloskey were in attendance at Dundarave House for the launch of this year’s Causeway Coast & Glens Business Awards. The awards ceremony takes place on Friday 29th September 2017 at the Ulster University Coleraine Campus at what promises to be a glittering finale with great entertainment and excitement; fun and networking; recognition and reward for all the finalists. For more info or to enter the awards visit http://www.causewaychamber.com/business-awards.